I’ve been doing some creative things lately in camp cooking – but I’ve been negligent in posting. Most of my energy has been in matching the aggressive schedule of a bunch of YouTubers, and collaborations around “Canteen Cup” cooking. Truth be told, the canteen cup (the aluminum or stainless, kidney-shaped pot, about 2-1/2 cups in volume, used by WWII GI’s) is a bit of a gimmick… but it’s fun. The basic idea is to use this simplest of equipment, and be creative as you can with it. Then you get ten ‘Tubers to film their recipes and post simultaneously. Fun, and challenging. For Easter, I did a S’mores Fondue – graham cracker sticks used to dip marshmallow (made from Peeps, of course!) and decadent chocolate sauce – all cooked in a canteen cup, over a campfire. The video is below. Read on for the full recipe! Add cream to just barely cover chips. Melt over low heat, stirring often, until you have a smooth chocolate sauce. Arrange peeps in one layer on top of the chocolate. Cover, and put coals, or a build a twiggy fire, on top of the cover. The effect is that of a broiler – heating the marshmallow from top-down. It may brown the marshmallows a bit – and that’s not a problem! During this phase, you don’t really need to keep the bottom on heat, as the chocolate will stay creamy, but you may want a little bit just to keep the chocolate warm. Use graham cracker sticks to dip the mixture, and enjoy! Of course, if this is too much trouble, you can just skewer the Peeps on a stick and roast them just like you would a regular marshmallow. Either way, it feels creative enough that you won’t feel bad about enjoying more Easter treats. I think roasting the peep on a stick and then dipping the Graham cracker only into the chocolate may be easier. Amaaaaazing. I highly enjoyed listening to all the laughter in your easter canteen cup video. 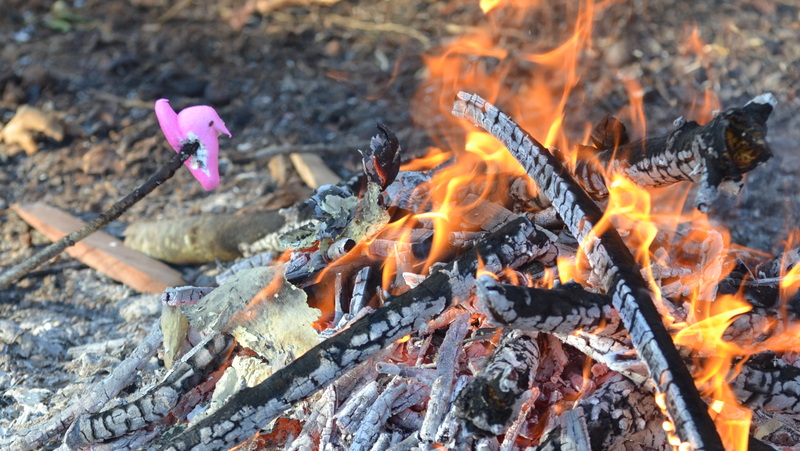 Using peeps to make s’mores took it to the next level.